I received assistance from your foundation a year ago and I just would like to say how thankful I am of all your help. It’s because of you I’m on my feet standing tall again. I just would like to say thanks a million times and I will be forever grateful of your support!!!!! If there is anything else I can assist with please contact me as soon as time permits!!!! Chuck and I would like to thank you for your generous gift of a seat elevator for his new wheelchair. This will greatly improve Chuck’s independence. I would like to take the time to thank you and the foundation for providing the funding help for a comfortable bed and making it possible to get rid of the two hospital beds and purchase one split king size bed that has an adjustable base and will perform just as well as an hospital bed would but will allow my spouse and myself to sleep together in comfort like any other couple. I would like to thank the Travis Roy Foundation for their generosity for the grant for my son, Michael Adams. This grant enabled him to have hand controls put in his truck. When my son received the email approving the grant, we were elated and felt so blessed. This grant has given him the independence he needs to continue to be the son, dad, brother and wonderful person that he is. My son’s determination and positive outlook on this life changing event is amazing. We are humbled by the generosity of the foundation and how they have and continue to help SCI people. Words will never express the gratitude we feel for this amazing gift. Within 2 weeks of my wife submitting a grant request to the Travis Roy Foundation for a ceiling lift we received notification that our grant was approved. I was blown away with the generosity and speediness of the request. The ceiling lift is the single most used piece of equipment every day. We are so happy we have had the pleasure of meeting Travis 2 times in the past year and have been able to personally thank him. He is such a kind and selfless person and we are so grateful. Please relay my thanks to the folks of the Travis Ropy Foundation for providing me with funds to purchase a Smartdrive for my wheelchair. I am very grateful for this technology and it is, and will likely continue to be, a positive change in my life. I would not have had the opportunity to experience this assistance without the TRF funding. After over 40 years as a wheelchair user, my wrists, elbows and shoulders are pretty well shot. This transition from an active life to a more sedate existence has been difficult for me psychologically, however, this device allows me to continue to get out and about without further degrading my arms. It gives my arms a bit of a rest and that helps me regain and maintain a positive attitude! I am very grateful for you financial assistance. Thank you again for helping me purchase this device. This gift has enabled us to modify our bathroom for our son Kiland. In 2013, Kiland suffered a serious spinal cord injury (level C6) in a diving accident. He is unable walk and has limited use of his hands. After his injury, access to our bathroom and the use of the shower was extremely difficult and frustrating for him. We took off the doors to our walk in shower, but he still had to transfer to a bench. Balancing on this bench wasn’t ideal and he couldn’t turn the knobs, so I would have to assist him with his showers. Now, at 18 years of age, he is wanting more independence and privacy. With the modification and roll in shower he is able to take a full shower without my help. He simply rolls his shower chair into the shower and relaxes in private. He can also use the sink with ease. The modification has been life changing for him. Kiland is so happy, that any family member who visits, he wants to show them his new bathroom. We cannot thank the Travis Roy Foundation enough for its support of Kiland. Our family will be forever grateful. We want to say Thank You from the bottom of our hearts for the generosity the Travis Roy Foundation gave Christopher in allowing him to become more independent. Christopher uses the elevator several times a day and it is a joy to see him utilize his bedroom, bathroom and “hang out space”. The elevator Travis Roy Foundation helped purchase is bringing normalcy into Christopher’s life. Thank you for your compassion and understanding and helping keep Christopher moving forward, focusing on getting stronger, independent and hopefully one day to walk again. I wanted to share my excitement upon opening the letter of grant approval I was floored and in shock. Through your generosity the ability to travel with my power chair which I need to become independent within my community as well as enjoying my outside hobbies with my family. This equipment will help to shape the way I live from this point on. I can’t thank you enough for the ability to live my life outside of my house to the fullest as well as the ability to be able to watch my children play sports. I am truly humbled I am looking forward to go fishing in the spring. Thank you again for your generosity I am truly humbled. If there is anything I can do to help going forward please let me know. We would like to give you a huge thank you. The computer with Dragon software has made a huge difference in Mary’s daily life. She talks with and sees the grandkids every several days. Your organization makes lives better and may you continue your service for many years to come. A few months ago I contacted the Travis Roy foundation for grant. About a month ago I received a grant in the amount of $5000. Since then I have used the money to make modifications to my vehicle so I can drive myself and not have to depend on someone for a ride every day. I wanted to take a moment of your time to express my gratitude for the Travis Roy Foundation. As some of you know, the road I face as a quadriplegic is not going to be easy. There are many things that I am going to struggle with and some things that I will not be able to achieve, especially on my own. To me, getting back on the road was one of these things. Driving equipment, although helpful for someone in my shoes, is very expensive. The money I received from the Travis Roy Foundation made it possible for me to achieve this milestone. Two years ago when I was injured, besides renovations to my home so it’s more accessible, driving again was one of my biggest goals. Once again I just want to say thank you. Your generosity humbles me and alters my perception. Hi my name is Tyrone Cook Sr. And would like to thank the foundation for their support and the grant I received for my hoyerlift. It is such a big help with transferring in and out of bed and my chair, it makes a big difference in my life. I would like to thank the Travis Roy Foundation for its generous gift of $600 for much needed repairs for my conversion van. I live at home with my wife and two of my three children. I have been paralyzed from my chest down (T7 level) since August of 1991. Over the last 4 1/2 years I have not been able to teach part time which was a big part of paying my bills. This grant will help me get back to work. Please excuse the tardiness of this thank you. I cannot thank you enough for your generosity. The $5000 grant that was put towards the purchase and installation of an elevator in my new home has provided me with so much freedom and independence and has made an enormous impact on my life. The elevator allows me to access all levels of my home and to enter and exit into and out of my home through the garage with ease. Words can not express my sincere appreciation to you for your assistance in providing me this privilege and giving me this liberty. Your kindness and generosity will remain with me forever. I would like to thank you so much for the $1,000 granted to me for my ramp. Because of this great gift, my parents do not have to carry me inside the house. I feel more independent because of this great gift. People do not understand that everyday things such as going inside my house became an obstacle. Dear Travis Roy Foundation, you have done a wonderful thing!, and I can’t thank you enough!I was surfing the web looking for help me and a friend. I really didn’t know what that was. My life was different after my injury. I needed something more meaningful, watching TV everyday wasn’t getting it. My son introduce me to the web, something called Webtv. I wanted something a little more advanced, so when I surfed and found the Travis Roy Foundation which help people with spinal cord injuries. The Travis Roy foundation has blessed me with a grant to have a computer and a naturally speaking dragon. This has giving me more independence it has made a great impact in my life! I can communication with my family, close by, and long distance. It allows me to take care of my business, read, listen to CD’s, watch video’s, and social media it’s a huge blessing and I thank you for that, by the grace of God. Now I feel part of the world through the internet. Travis thank you very much! being confine to a wheelchair hasn’t stopped you!….Keep the great work up helping me, and others, may God continue to bless you and the people who are responsible for helping you with this foundation. May I say thank you Travis Roy Foundation for getting me a new roho cushion for my back up wheelchair. For the longest time I’ve been switching cushions between two chairs because the last cushion ripped beyond repair. One chair is powered and the other is a manual that I often switch back and forth due to going out or staying in. As expensive as these cushions are I did not know where or when I would be able to get one myself but you came to my rescue. Whew! What a difference it has been having two cushions again. I’m so thankful for the good you do not only for me but for many other people as well. So thank you again Travis Roy foundation you have truly made a difference here. I wanted to take this opportunity to thank you and all of those responsible for the financial assistance. The van that I purchased back in April 2014 would probably still be sitting in my garage without your help, It had a lift on it already but was not set up so I could drive it. I needed power door openers, a power seat base, and hand controls to be able to drive it independently. I picked up my van from having the additional modifications made on June 20. What a change over the 1985 van that I had been driving! I’ve owned and driven that van since it was new. The van I bought in 2014 was a 2011 model with only 18,000 miles. Oh what a difference a 26 year newer vehicle makes!! Although the 1985 has been like one of the family. I know thank you just doesn’t seem like nearly enough! My deepest heartfelt thanks for your assistance in helping me to keep my independence. I would like to thank you for the grant you have given me for my computer. As you know, the complications that come with a spinal cord injury do not stop a few months after being injured; they are life long and new ones come and go. Recently, over the past few months, I have been experiencing severe stomach pains and have not been comfortable enough to attend school nor have I been comfortable enough to enjoy the things that I like to do. The computer that your Foundation as purchased for me will allow me to catch up on my high school work and allow me to move on to college where my computer will continue to help me to progress into my future with confidence. Though my stomach pains are temporary (I hope), the love and understanding I feel when working at my computer will always be there and I thank you so much for what your foundation does for people with spinal cord injuries. My accident was life changing and so is this computer (in a great way). My hopes and dreams for a better than normal life and career, will now be easier to achieve. Thank you so much for awarding me a grant to purchase a new laptop computer. The grant is a tremendous help, and I am truly grateful for your support. I just finished my first year of medical school at the University of Wisconsin. It was a year full of challenges and triumphs, and I am convinced that medicine is my true calling. Thank you to your organization for support students who have overcome spinal cord injuries. I hope to serve as a mentor for students with disabilities who want to become doctors. Again, Thank You. First of all I would like to thank [the] Lord for making Foundations like yours help people like me. Thank you for granting me the grant to get my lift replaced. It came just as it was getting worse and breaking more. Now I can keep my independence, and keep trying to find work. I’ve been all alone since my mom passed a few years ago and depend on no one. I’ve had it bad sense then, but with the blessing you gave me I can keep moving forward. Again Thank You from the bottom of my heart. Thank you so much for awarding me a grant for an iPod for my medical education. This technology will be invaluable for studying purposes, and I am so grateful for this. Your support truly means a lot. I finished my first semester of medical school, and I started the second semester last week. It has been going really well, and I am excited for gross anatomy this semester. Again, thank you so much for your support! I would like to thank Travis Roy Foundation for their generous gift that will allow me to continue leading an active and independent life. Spinal cord injury puts all sorts of limitations and challenges in people’s lives, and I am very grateful that with your help I will be able to overcome one of these challenges. Installation of hand controls in my car brought self sufficiency back into my life and will make my unlimited mobility possible. Thank you very much for the grant, [for] the computer and dragon software. They are both going to be very helpful for school which I’m sure you know is more difficult. My family and I have appreciated your support and help through out this. Hope all is well. Thank you so much for your kindness. The computer will be very helpful to Kelly. You have made a difficult year that much better. Thank you very much for the grant to pay for my platform lift. It has truly changed my life. I was not able to get out of my house by myself, and now I can get out anytime I need or want to. Once again, thank you very much. Words cannot express the gratitude I have for your organization. People with SCI are blessed to have you to help out in our time of great need. I’m writing this note to express how grateful I’m for having receiving your charitable gift which is a new laptop computer. In fact, it is more than a computer that I got. It is the materialization of the love and care of the noble Travis Roy Foundation towards vulnerable people. We are truly grateful for your commitment and dedication to helping family’s like ours who are adapting and living fully in the setting of a spinal cord injury. On October 27, 2012, we were stunned with the unimaginable, a football injury resulting in a catastrophic spinal cord injury to our son, Sterling Thomas. We found ourselves in need of your support and you came through for us. With your grant of $2467, a shower chair has been purchased and delivered to Sterling. Thanks to you, Sterling is able to luxuriate in what most of us take for granted…a steamy, warm shower! Yes, Sterling is glad to have a shower chair which allows him to perform his personal care with greater independence and dignity. Again, thank you, Travis Roy Foundation, so much for helping Sterling and our family to “Move Forward”. Thank you for awarding me this amazing grant for a computer. I am very excited to receive it in the next few weeks and be able to independently do school work. I am very excited that I will have some assistive technology to help me maneuver the computer so that I can be successful in completing my work. Having this computer will help me be one step closer in achieving my goal to becoming an accessibility and sustainability consultant in the design field. Thank you! At this time around Thanksgiving, we are reminded of all the blessings we’ve received thru the year….. The greatest blessing was the grant given to my brother Karl Seitz, from your generous Foundation. He is loving the amazing computer he recently received. It will allow him to communicate with his doctors to keep them updated in his daily care. Most of all, it connects him to the bigger world and he will be able to feel productive and less isolated. “We” thank you from the bottom of our hearts. You are an angel sent from above to help others in need. I just broke down in tears, the happiest tears out of any of my daily tears over the past 6 months. Please extent mine, and my sister’s enormous gratitude to the foundation. I don’t even know what to say, I’m very taken back in relief, tears and overwhelmed that someone is going to help her. God Bless You and The Foundation – please let me them know that gratitude isn’t a big enough word, there are no words. It’s 7p.m. CDT and I AM SPEECHLESS. God bless you and the Board and I may have understated just how much of a “blessing” this is. I have slept on a recliner since my accident and the last time I tried a mattress was when forced to evacuate during Hurricane Katrina in 2005. I laid down for perhaps an hour and had to sleep in the motel chair. THANK YOU so much and I should overcome this shock by tomorrow and will work on new estimates to keep the price at or under $700. I will be in touch with you before Thursday and thank you again. I thought the Board had voted by now and had given up hope. 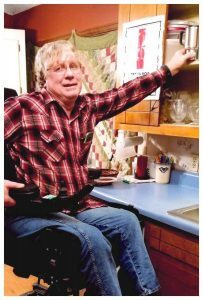 OMNI Behavioral Health wishes to thank the Travis Roy Foundation for the generous grant to help install a wheelchair ramp for an individual we work with in the small rural town of Ithaca Nebraska. With the new ramp, which will be installed next week, he will be able to enjoy more activities with his family and regular trips to church and out to eat, and attend his regular doctor appointments in Omaha. In the next few weeks I am sure you will be hearing from his guardian and other family members also about the newly installed ramp. We appreciate the fact that there are organizations that are willing to support the disabled individuals in our nation to live their lives fully and completely to the best of their ability. Thank-you for allowing this to be accomplished in a timely manner. We are sooooo appreciative of the grant to help us out with the ceiling lift. It is truly so much help for me when I am putting Bill in the bed at night, and getting him up in the morning. He weighs around 250 and even though we transfer on a slide board I am doing at least 60% of the work. The lift makes it so much easier. Thank you and the Travis Roy family and Foundation. What a wonderful gift you are giving. Thank you for the Grant for the Dell Computer. I just wanted to share with you what the grant will do for me and my future. First I would like to give you a little background on myself. I have been paralyzed from a swimming accident since June of 1990 and I have worked extremely hard to not let my paralysis dictate my life, or my dreams, for that matter. I have two children that I had after my accident. I have a daughter Britt she is 15 this upcoming April and my son Tyler is turning 12 Feb 13th. They are the reason I keep fighting the fight so to speak. I have been successful at virtually everything I have set my mind to doing from raising my children to working countless hours at my previous corporate career with AT&T. I believe each and every one of us has what it takes to accomplish the dreams we have. I decided to go to school after being laid off during the rough economy. I had numerous setbacks that financially put me in a position that I was not sure if I could afford to go to college. I realized that I needed some help to get through the temporary issues. So I started researching and came across your foundation and it has truly been a blessing. I will be able to complete my education in a timely manner and continue to support my family. Thank you again for having such a wonderful foundation. If there is anything I can ever do in the future for the foundation please don’t hesitate to contact me. 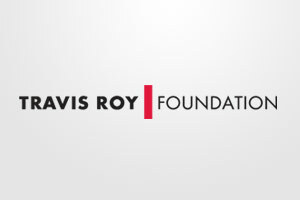 Many thanks to Travis Roy and to each of the trustees of this extraordinary foundation for your dedication to helping improve the lives of so many. I am a recent beneficiary of your kindness and generosity, having received a grant to purchase a standing frame, which will undoubtedly have profoundly positive effects on my physical and psychological health. Hello Travis Roy Foundation, I want to thank you for everything your Foundation has done for me. I have the best computer set-up anybody could ask for. I get compliments from visitors walking by my room. I would like to express my sincerest gratitude to the Travis Roy Foundation for the generous grant awarded to me. Because of this grant I am on my way to a more independent life! I cannot express how much we thank you for the money you have donated to the Jackson Family They have are the appointment for the wheelchair lift to be installed. You have provided hope when there was none to find. Thank you to your staff, board members, and the Travis Roy Foundation for what you have done. We write to express our appreciation and gratefulness on behalf of Ed and Carol Gregory. Ed is a quadriplegic cared for at home by his wife Carol since 2009. The Foundation approved the purchase of a $2100 shower chair in Dec 2011. The chair is a God-send and makes it immensely easier to bathe Ed and keep him clean. When told of your approval of the chair, he said, “You mean I can now get a shower?” Since sponge baths has been his lot for two years and more, he was elated, as was Carol. So thanks to your donors for opening their hearts and wallets to those who suffer and are in great need. Thanks to the Board for choosing Ed as a recipient of not-enough-funds to go around for the many requests from which you must choose. Thanks to your very helpful and efficient staff which interfaces with the public. God bless you all beautifully. I am writing to you all at the Travis Roy Foundation to express my sincere and deepest appreciation for your help fixing my kitchen. The difference you made in my daily life is so incredible and my life has become much easier. There really are no proper words except on the bottom of your stationery “Helping others move Forward”. I have to say that does say a lot and you all have given me a chance to move forward and be so much more independent. I will forever be grateful and will send you photographs in a a few weeks. To the Travis Roy Foundation! Thank you for the grant to help me be able to get my new wheelchair! Ya’ll are a life saver…. I would like to thank you for your kind and generous grants I applied for in 2011. Your grants allow me to live as independently as I can. My new computer is running and my environmental control unit in my apartment is just great. Also the grant for my new wheelchair necessities has allowed me to get rid of my broken and unrepairable wheelchair. As we all gather for Christmas and the New Year with family and friends, I will be reflecting on all that brings meaning and joy to my life. I will be thinking of all the new friends that I have made through my new life’s journey. I want you to know that I am so proud and grateful to the Travis Roy Foundation for the great gift to help me continue my new life. This door opener will allow me to get in and out of my house by myself, and let me have more freedom then before. The Travis Roy Foundation has gone above and beyond by helping people get back to a better level of life. At this time of the year, we have been taught that it’s “better to give then to receive”. I have always been a giver, but this is one gift that I’m very happy to receive. This just goes to show me about how my life has touched so many others. It is true; I am having “A WONDERFUL LIFE” through good times and bad! Your donation shows me that I must be here to make a difference on my life or influence someone else’s life. Even through a tragedy, you must keep your head up, because you don’t known how you may affect others. Again, Thank You, and I will keep you in my prayers. May you all have many more. Please keep up the great work! Thank you for the grant of 5,000.00 for van modifications. You have gave me the gift of independence of a life time. I have been able to volunteer in my community, work and have a social life. And for that, I thank you! Recently, I volunteered for the city cleanup sweep. I wore a shirt that said, “We matter We contribute”. I think it’s important to show awareness of the disability community. I hope it inspires people to realize.. if she can contribute in a wheelchair, I can too! It’s only possible for me to help others, because you helped me! God Bless you, Have a Merry x-mas & Happy New Year! I know I have expressed in previous e-mails for the graciousness of this grant and how it would allow me to pay it forward and hopefully as the bills shows I spent this money frugally. I can’t imagine how many applications come in each month and what an arduous task that must be for the Board of Directors to make difficult decisions on disbursements. I heard about Travis Roy long before my brother Daniel Iagatta’s c4 injury in 2004 and I certainly didn’t know, at the time, that it would impact us in a positive way. He is 48 years old. He has been driving for 5 or 6 years now and when he received his new chair he wasn’t able to do as much and he wasn’t getting around as much. I would love to thank the Travis Roy Foundation, on behalf of myself and Dan’s family, for retrofitting his new chair to his van in order to gain his independence back. You have made our day, month and year. What a wonderful surprise it was to get your note. We are trying to save more money to do the full conversion and appreciate the year of time to reach that goal. Hopefully we will reach it sooner than later – this grant really helps us get on our way! I look forward to sending pictures of me in the van with my three little girls. I will keep you posted. Please extend my deepest gratitude to all in your organization and to the trustees. I wish you all could be here today to feel the joy we are feeling. Words do not do my feelings justice. THANK YOU! Your grant has not only changed today, but many days in the future. Thank you so much for negotiating this and sorry if it was any hassle. I have had the wheels now for 4 months and without them I would not have had the independence I enjoy now. Not to mention they are kind of fun. I can wheel for miles and it is a breeze! Travis Roy did a talk at the prep school I attended, Brooks School, when I was there around 2003 or 2004. I never thought years later that I myself would face his challenges and I remember him to this day. In this light, the grant the Foundation has awarded me is even more special. I am both touched and extremely grateful that there are people out there who understand my needs and are willing to help out! I will send you all a photo of me with my wheels in the near future. I would like to thank you for helping realize my dream. You played such a huge role in this entire process. Thanks to you I have obtained a huge degree of independence. I appreciate all of your time, energy, and effort that you have invested in order for me to obtain my dream computer. I would like to say thank you for the funding that you provided which allowed me to get the lift for my pick-up truck so I can take my power wheelchair outside of the 4 walls of my home. Your generosity means so much to me and has given me new hope. I can now go places I hadn’t been able to in years – including my appointments! You’ve made my life so much easier and joyful. I would never have been able to afford this on my own. Thank you for helping others move forward!!! Thank you so much for getting me the funds for the head mouse. I am still learning to use it but it is giving me something to do with my time! Living at a nursing home is hard, but this helps make it better. I recently received funding from the Travis Roy Foundation to pay for modifications to my van to make it wheelchair accessible. The van came out great! I’m happy with it. The new conversion done by HDS of GA, has a 9″ cut in the floor, making my driving from a power chair easy, comfortable, and safe. Special thanks to the Travis Roy Foundation for understanding the issue of independence and assisting people that can then help themselves and others. I am forwarding some pictures of the van. Investing in people with disabilities returns us to productivity. We are all in this together. There are no words to say thank you for your wonderful gift of independence, as I am sure you are aware, how important that is in daily living. You and the Foundation are inspirational to all of us who live this challenging life. Also, I would like you to know how wonderful Mrs. Taylor and the Morse’s are – you chose well, and I am so blessed for getting the opportunity to get to know them. I hope that if you are ever on the Cape, that I have a chance to meet you and thank you in person. Thank you so much for everything you have done for Grace and our family. Thank you so much for your generosity, kindness, and awesomeness. We will cherish your kindness for now and forever. Words cannot express our gratitude! 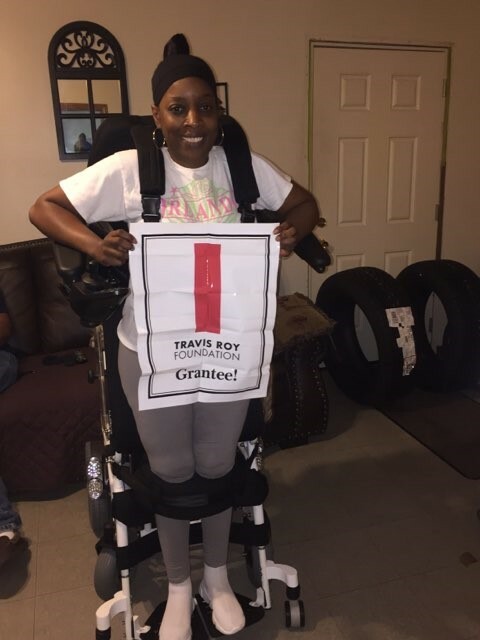 My name is Christopher Miller and I would like to thank the Travis Roy Foundation for the grant of $1400 for a new computer, printer and portable hand controls for a car. I don’t know how I could have got this without the foundation. I would like to thank all at the Travis Roy Foundation for what they have done for me. Thank You and god bless the Travis Roy Foundation. Post spinal cord injury my “life” has changed. Maneuvering around home is always a formidable task. My wife constantly picks-up after our two daughters (ages 5 & 9), but it is like shoveling during a snow storm…….minimal results. My girls fill the house with love and joy, but continually litter the floor with books, toys, shoes. All of which make wheelchair mobility rough. Fortunately, we are now able to utilize our downstairs (family room, toy room, kitchen) due to a newly constructed ramp. I can now roll around my property far more efficient. This foundation provided me the ability to acheive further independence, without their aid and support this could not have happened. Thanks for all your much needed support. I would like to offer my sincerest thank you for the funding that you provided that allowed me to purchase an Easystand Evolv Standing Frame. Throughout my life I have always made my health and physical fitness a top priority. Since my skiing injury and associated quadriplegia I have realized even more so how extremely important it is to take care of my body. I regularly go to physical therapy to work on my strength and conditioning, eat a healthy balanced diet, and maintain an active lifestyle. This was all great in maintaining what strength I did have in a wheelchair, but did little to challenge my body in an upright position. The only way I could do this was with the purchase of a standing frame, something that was financially far outside my budget. This is where your foundation was so helpful. By providing me the funding to purchase a standing frame you have given me the perfect piece of equipment to help challenge my body and build fitness in ways that I could have never done before. My balance has improved, I feel lightheaded less often, and the psychological feeling of being tall again is so incredible it’s hard to explain. Thank you! Thank you, for providing me with a piece of equipment that makes me healthier. And, thank you for being an organization that helps people challenged by this disability. Thank you so much for the grant for my bathroom. We moved in a few weeks ago. What a treat to have this wonderful bathroom that I can use. You have helped me so much and given me even more independence. I’ll never be able to thank you enough. But again thank you for helping me and other people in my position. OH MY GOSH!!!!! I cannot tell you how happy you just made our family!! What a blessing! I am ecstatic!! THANK YOU ….. THANK YOU….. THANK YOU!!! I just wanted to say “Thank you”! We are so grateful that you and your staff chose us for this grant. When we started this project, we did it on a wing and a prayer! We hope the enclosed pictures do the job justice. Thanks again, to each of you who helped my dream come true! I greatly appreciate your response, in helping me acquire my Truck Lift. It takes people that care to make things happen! Ones that can see past the chair and sees a person with a need and purpose. Having the independence will truly enhance my life. With a helping hand you made my life’s journey possible. I could not have done it without you and for that I Thank You! On behalf of my brother George King (Geo) and his family, we wish to sincerely thank you for the Travis Roy Foundation grant. It really means a lot to our family and George at such a difficult time. We feel honored; and plan someday to help others like Travis and the Foundation have helped George. Recently my son was given one of your grants for a ceiling lift. We just wanted to say how much we appreciate the gift. It has made life a whole lot easier for myself and Kevin, my son, he has been able to sit on the couch with the family and is able to get out of the wheelchair for a little while and feel like a “normal” person. Again THANK YOU VERY MUCH. Thank you so very much for the grant that my husband and I received! We were so surprised to be awarded that money! The pocket door that was installed has made all the difference for my husband to be able to get in and out of the bathroom with ease in his wheelchair. We are so thankful that there are foundations around like yours that help individuals who really need it. We can’t thank you enough! We would like to take the time to thank you once again for the great donation to my daughter. She loves the computer and wheelchair ramp. It has made all our lives much better. Thanks once again to the great people you are. Thank you so much for granting me the funds for the truck lift that I requested. This is a huge deal to me; I would never have afforded this without your help. My family and I want to thank you from the bottom of our hearts. This will improve life tremendously for my wife, son, and I. Thank You. Cory and I would like to thank the Travis Roy Foundation for its generous gift to enable us to have the floors on the main level of our home modified. The floors are beautiful and Corey has no trouble getting around on the main floor now. Words cannot express our gratitude for this grant money. Please extend our thanks to the other members of this foundation. 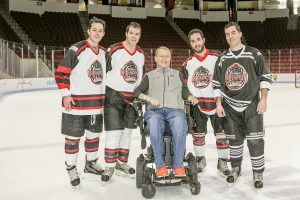 Without foundations such as the Travis Roy Foundation, people in Cory’s situation would not have the opportunities to make such necessary changes or improve quality of life and independent mobility. God Bless you all and thank you with all our heart. Please find enclosed a picture of my beautiful new computer as well as myself! I just wanted to let you all know how wonderful it is to run my small business with these. With such high functioning equipment my life has greatly changed. Not having to worry if I can receive a fax where of my computer will crash again, is priceless. Living life with a severe disability is truly hard… but please know that you have given something to me that makes it A LOT better! I will never take it for granted nor will I forget what you’ve done for me. I want to thank you very much for accepting/choosing me to receive a Koran from the foundation. My bathroom looks great and works great for me and my home health aides. It is hard to put into words how grateful I am. Please let Travis know what a wonderful foundation he has. Thanks again! God Bless you all! I just got a Toyota Sienna van on January 2, 2009. I am writing this letter to thank you for your foundation to help me for the grant to purchase the left. I’m enjoying the van very much with the convertible. It’s giving me a lot of opportunities to do different activity in life especially for my success career in school. However, I’m not afraid to be late to the school anymore. I appreciate it from the bottom of my heart to make my dream come true.